Rain is one of those games that comes so close to getting everything right that it seems unfair not to praise it just for the proximity. Rain is basically a stealth game, with some elements that might remind you of puzzles and platformers. Generally, you’ll spend your time devising the best way to avoid the whitewashed monsters that inhabit its world. They seem most interested in a girl who’s around your age. You spot her frequently running off in the distance, realizing she's unable to hear your cries out to her or see your frantic waves to get her attention. In fact, not counting your footsteps, most of this stealth game is silent miming and unspoken expressions left for interpretation. In avoiding the stenciled monster figures, you’ll hide under canopies and awnings instead of hiding behind the more stealth-traditional shadows. While you’re under the incessant downpour of Rain’s world, the droplets of water outline your shape, making you visible to the creatures. Under the protection of some kind of cover, you’re invisible and hidden. And so are your enemies, as well as the ever-elusive little girl you so desperately want to reach. For the first third of the game, you almost always just miss an encounter with the little girl. You’re always just a second too late, or one ledge too far. The little boy stretches his hand out, struggling against the fruitlessness of doing so. The constant distance between them is palpable and it feels like she might never realize he exists. One of the first few times you actually get close enough to interact with her, you save her life. But she can’t even see you to understand that you did. You’re stuck under cover from the rain, behind a door, doing your best to help keep her alive without so much as a glance from her in your direction. She walks on unaware, ever distant. As Claude Debussy's "Clair de Lune" (played by Jackson Berkey) plays in the background throughout most of the game, I wonder why it is, then, that I’m not so struck by all of this. A terrified girl. A courageous little boy. A very unique take on the whole stealth thing. As the game draws to an end at its eighth chapter, I make a decision about the six or so hours I’ve spent with Rain: all of it is good, in theory. But everything it tries to do falls just a step short of the height of its potential. Adding up the missed steps makes Rain feel a little less than memorable. At the start of Rain, you don’t know much about this world. You know of its threats and your goal. Of your function in the world, but not why or how. Near the end, the threads are slowly tied together. At the time I thought: this was it. Here comes the payoff. There’d be some revelatory moment where everything would make sense, and the truth of it would be so beautiful and complex that I’d think back on all the moments I had—moments of running and chasing and hiding and dying—and they’d be all the more meaningful thanks to this final bit of information the game was finally willing to reveal. For all the silence and for all my guesses, I’d finally reached the last chapter where all would be revealed. And then it fell just short of what I’d hoped it would be. So while some sense was made and some artful wrap-up drawn together, what was revealed wasn’t as meaningful as I needed it to be to have made the hours of stealthy escaping so worthwhile. With the right ending, it could have made the friendship between the little boy and girl that much more complex. Perhaps their fates could be intertwined in some unpredictable, maybe even haunting way so as to change the definition of their friendship entirely. The explanation of the what and the whys of Rain’s world could have been so much more clever as to make me appreciate the struggles of the characters more, or maybe understand the existence of the monsters in some romanticized way that would effectively change the hours I’d just spent hiding from them. I was waiting for a dramatic shift that would make me feel like I’d played two games, the naive one I played with my thumbs and the real one I’m to later experience in my head. Imagine a The Sixth Sense kind of twist that takes everything you knew about an experience and flips it on its head. If that’s what I’d been waiting for this whole time, I could see value in the otherwise straightforward storytelling. The truth of it was a little underwhelming, and the game suffers for not living up to its potential. I couldn’t help but feel all those ideas and setup were building to something grand, and then it just didn’t. Rain is poetic by its very nature, but not necessarily successfully so. Even the watercolor painting cinematics leave a lot to be desired. They’re interesting and new, but the blotched shapes rob those moments of their emotion. It felt artful for the sake of being artful. Unique for the sake of being unique, without truly understanding what makes something so. For a game that relies so much on its silence—save for the music and aforementioned footsteps—the written narration that directs the story is noisy. The writing feels forced, like it’s grasping at feelings and conjured drama that just isn’t there. Rain certainly has its moments at the end that revive the flat story, when it finally chooses to show you something other than running and escaping and death, but they’re lost in a rush near the end, crammed into about 45 minutes worth of action. Rain would have benefited from letting its most powerful moments breathe a little more. A game, I think, can be appreciated on different levels. There’s story, there’s the challenge and fun of the game itself, there’s character building and voice acting and art and music. There are many games I fall in love with, all for different reasons. I was never in love with Rain’s art, which is basically dark and dull colors that certainly make sense for the setting but the atmosphere suffers from characters that are marred by a lack of detail and, in the case of the monsters, lack of imagination. They all look like some vaguely drawn renditions of already existing creatures or visions of creatures. I'd hoped for something dreamier. The music is somber in context, and so fitting, even if it does reuse just a handful of tracks. 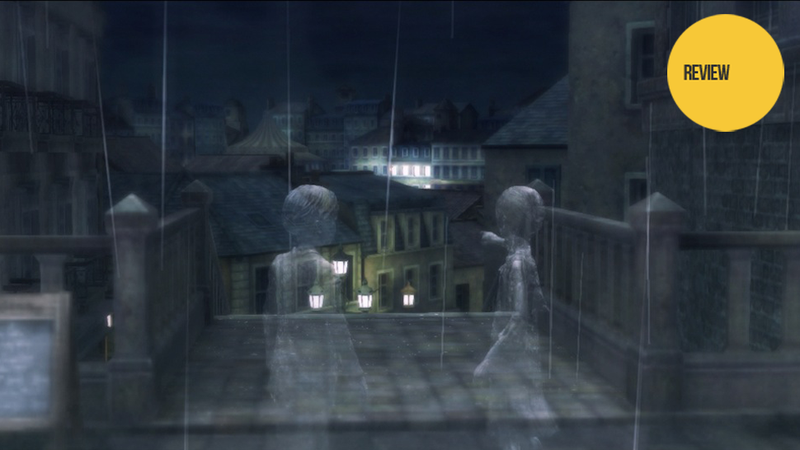 But where I most had hope for Rain was in its story and its unique presentation as a stealth game. Most of it was charming, and even my parents—two foreigners who still don’t quite understand why I play video games and have made a career out of it—enjoyed watching me play. But by the time of its big narrative unveiling, I felt like it was missing the kind of depth that could have revived the entire experience. And while the stealth elements were certainly charming in its own way, the scenarios and puzzles were never particularly difficult or complex. Reflecting back on Rain had me very conflicted. I’ll be clear that Rain has some very good ideas and it’s a game with good intentions. It plays with storytelling methods that are by their nature difficult to execute. Difficult to get right. And, unfortunately, Rain didn't show a mastery of that technique. By all means, any gamer who has an appreciation for games with worthwhile ideas that should be taken as example by others should certainly check out Rain. But for all those ideas, their execution never felt fully realized. With all my criticisms, I don’t feel right condemning Rain to the dregs of games past that have earned the Kotaku-branded “No” review assessment. I think many of us could lean on the good world-building elements and signature moments to justify the experience. But I do feel a heavy caveat has to follow with my suggestion that you should play it. You should play it because, yes, it’s a step in the right direction. Rain drags its feet through some of those forward movements, but it’s an A for effort game. It’s a game we can learn from, that other games should learn from. A game I can feel good about having my parents watch as I play it. And, fortunately, all of this can be appreciated without taking up too much of your time.